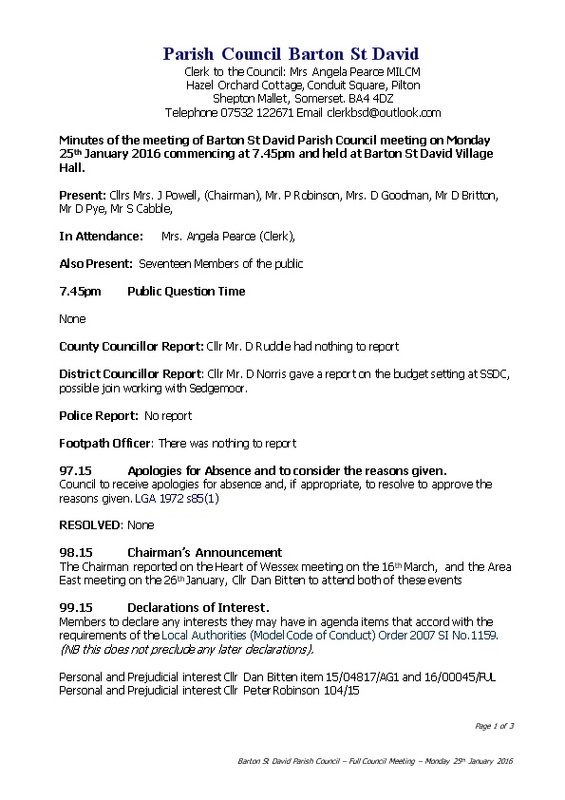 Minutes of the meeting of Barton St David Parish Council meeting on Monday 25th January 2016 commencing at 7.45pm and held at Barton St David Village Hall. District Councillor Report: Cllr Mr. D Norris gave a report on the budget setting at SSDC, possible join working with Sedgemoor. 97.15 Apologies for Absence and to consider the reasons given. Members to declare any interests they may have in agenda items that accord with the requirements of the Local Authorities (Model Code of Conduct) Order 2007 SI No.1159. (NB this does not preclude any later declarations). RESOLVED: - That the Minutes of the meeting held on 21st December 2015 be signed as a true record. It was reported that motorbikers had been seen riding along the highways without wearing helmets. RESOLVED: - The Parish Council requested that it needed to see at least three quotes and information about where the reminding funds were coming from to complete the heating. RESOLVED: - Cllr Bitten gave an overview of being a Parish Environment Warden, and it was agreed for Cllr Bitten to take this role on. RESOLVED:- It was agreed to advertise the post with SALC and the Parish magazine, closing date 8th February with interviews the week of the 12th February.